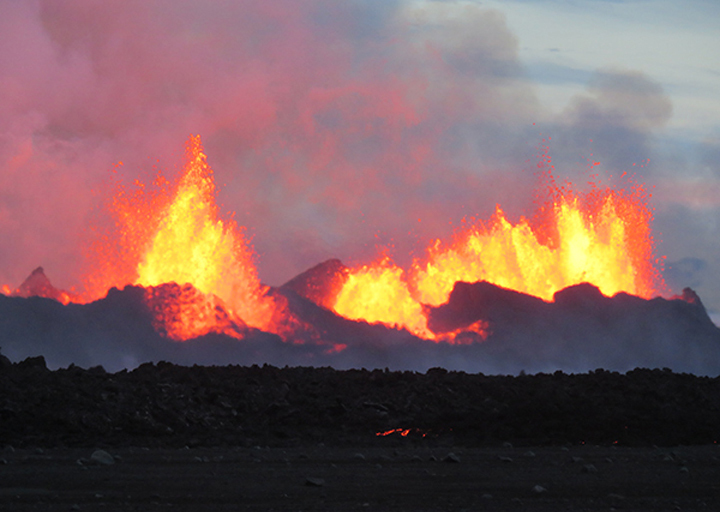 Structural geology and tectonics expert Jeffrey Karson, co-founder of the Syracuse University Lava Project with sculptor Bob Wysocki, recently traveled to Iceland to monitor early stages of the Holuhraun lava field eruption, a volcanic system that has been spewing lava since early September. He brought back photographs of his excursion and research. 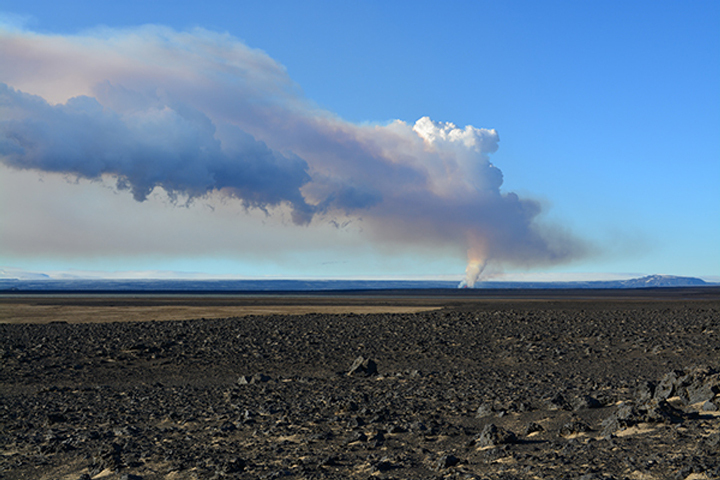 In a landscape reminiscent of the lunar surface, a Phantom UAV (unmanned aerial vehicle) captured this image of the main eruptive vents, about two kilometers away. The drone was at an altitude of about 200 meters. Fire meets water. 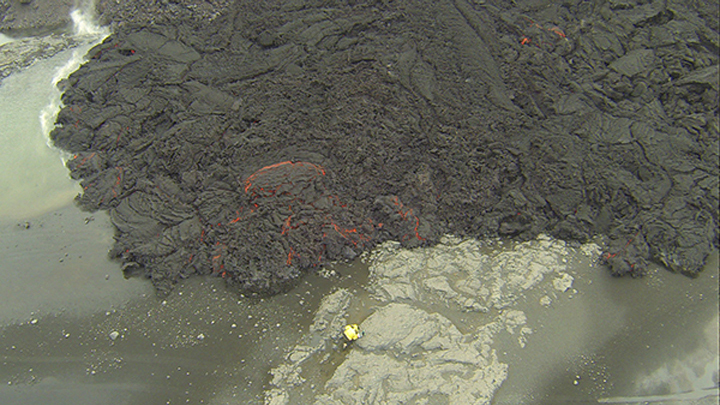 Incandescent orange lava magnifies the cracks in the black outer crust of solidified lava. 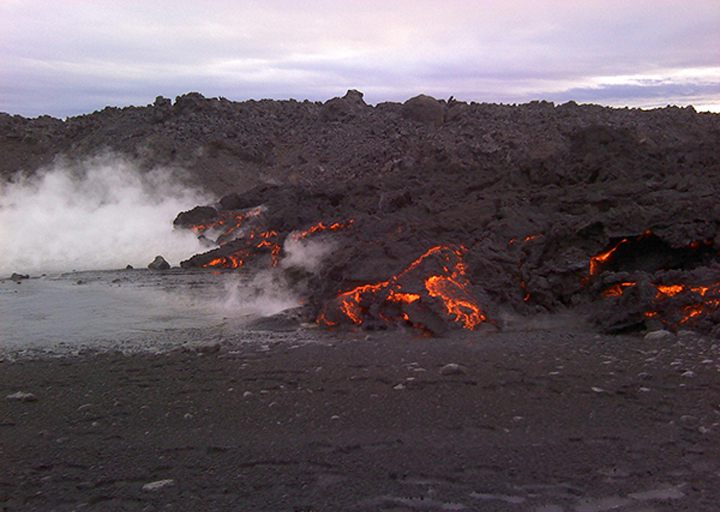 Steam forms when the lava flows into a nearby river. 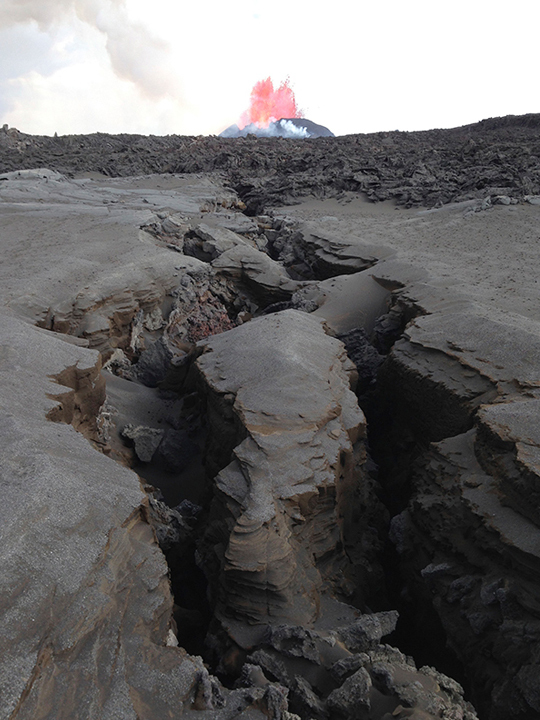 An overflight view of Jeffrey Karson, in yellow coat, shows him making measurements of the lava flow front. This scene of an active flow lobe on a riverbank is recorded by drone flight at about 100 meters altitude. 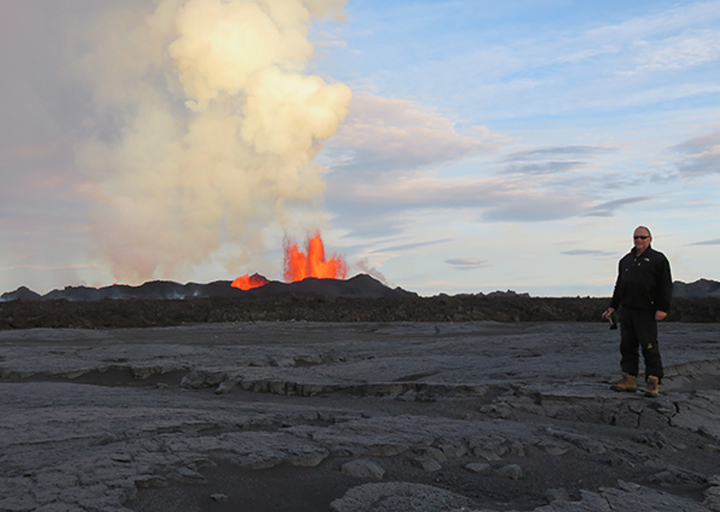 Karson Earth is an Earth sciences professor in the College of Arts and Sciences regularly travels to Iceland to study volcanic structures. 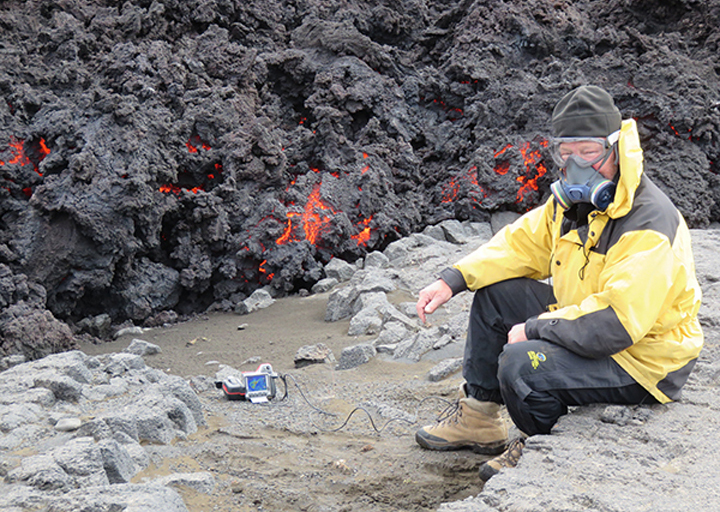 Jeffrey Karson on the ground at an active lava flow lobe, works with instruments for making infrared camera measurements. 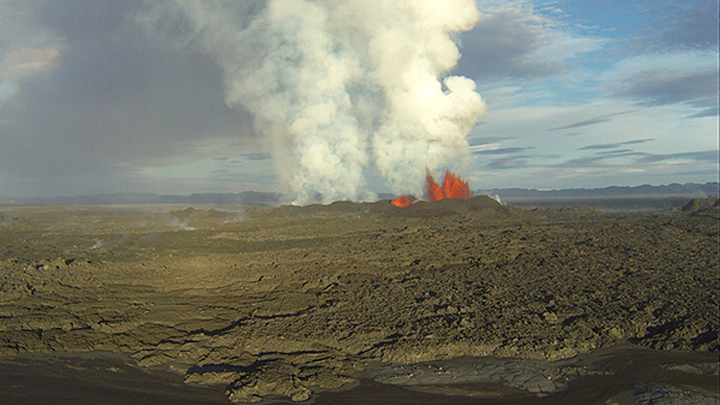 Gas masks and eye protection are required because of hot, poisonous volcanic gases and wind at the eruption site. 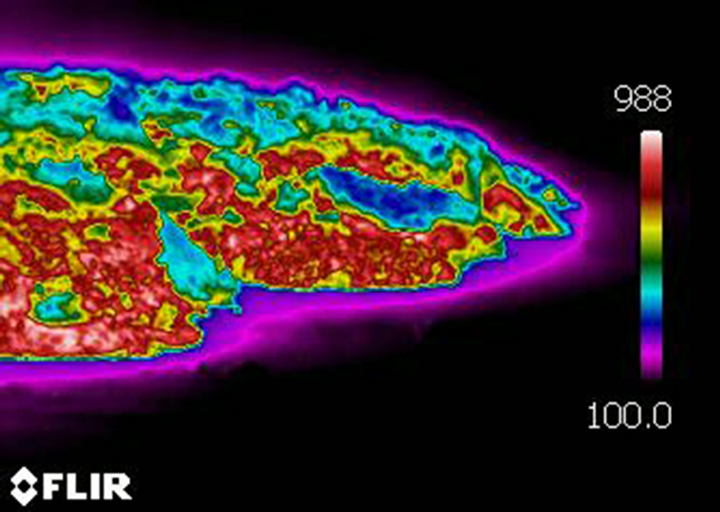 Pictured here is an infrared image readout from a Forward-Looking InfraRed (FLIR) camera. 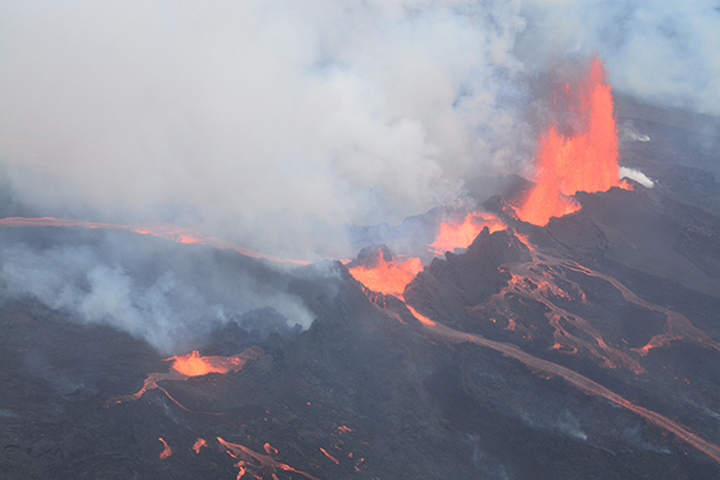 In this image, the temperature scale to the right is in degrees Centigrade (1000°C=2100°F).